The Samsung Galaxy Tab is an Android-based tablet computer produced by Samsung. The Galaxy Tab has a 7-inch (180 mm) TFT-LCD touchscreen, plus the stunning 1024 x 600 high resolution, the display effect is perfect enough while watching videos/movies. Have you ever thought of playing your DVD collections on Samsung Galaxy Tab? Actually, it's really a good idea to watch DVD movies on Samsung Galaxy Tab. Not only it featured a big, outstanding display screen that pretty better for watching, also avoid getting discs scratched, damaged or lost. Unfortunately, there is no built-in DVD-ROM or DVD player in the Galaxy Tab, so you can't enjoy DVD movies on it. If you want to rock your Samsung smartphone with your favorite DVD movies on the go, you should use an additional conversion tool to convert DVD to Samsung Galaxy Tab supported video format. For DVD movies are protected usually, the ability of removing the copy protection (including CSS, Region, RCE, Sony ARccOS, etc) is necessary for conversion tool. MacX DVD Ripper Pro is an ideal DVD to Galaxy Tab converter for Mac users to copy DVD content to Samsung Galaxy Tab on Mac. In addition, you can also convert DVD to other Samsung family devices, including Intrepid,Omnia i900, W699, U808,samsung i8910 hd etc. This DVD to Galaxy Tab converter for Mac always catches up with the latest DVD copy protection variant and is able to copy protected DVD without hassle. Before you backup DVD to Samsung Galaxy Tab, you need to take few minutes to download MacX DVD Ripper Pro to you Mac. Insert the DVD disc into the disc drive, click the "DVD Disc" button to import it. If the DVD movie is saved as a folder on your computer, you need to click the "DVD path" button to locate that folder; or "DVD ISO" to import DVD from DVD folder saved on your computer. New movies on DVD, like Captain America: Civil War, Deadpool are all supported to convert. Select the output format as you want, since you need to convert DVD to Samsung Galaxy Tab, here you just need to choose "to Samsung". Choose the proper profile setting for the converted video for your phone. After you finish all the steps above, click "RUN"; to begin converting DVD to Galaxy Tab on Mac. You can view the conversion progress and are able to cancel the converting process at anytime. All the tasks of conversion will be finished at fast speed and high output quality. Then you are ready to watch DVD on Samsung Galaxy Tab for more fun. For Windows users, please check MacX DVD Ripper Pro for Windows. Tips: For DVD to iPhone iPad iPod transfer, MacX MediaTrans comes as a very helpful tool, which lets you move the DVD movie file from Mac (macOS Mojave incl.) to iOS devcies without iTunes syncing. Notice: We only advocates using this best DVD ripper to rip commercial DVDs to Samsung Galaxy Tab on Mac under the concept of Fair Use and does not encourage any illegal reproduction or distribution of copyrighted content. Please abide by the local DVD copyright law before doing it. 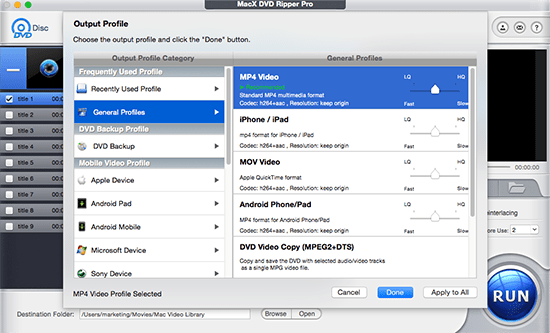 This tutorial will show you how to rip DVD to Android on Mac OS with MacX DVD Ripper Pro so that you could watch DVD movies on Android phones HTC, Samsung, Galaxy Tab etc.